A joint meeting of the KS and NE Appaloosa clubs was held December 3rd, 2016 at McPherson, KS. There were 14 members from NE and 13 members from KS present. The Tri-Spots horse show was discussed. The dates for the 2017 show will be April 22-23rd in Hutchinson, KS. Friday, April 21st is also available if needed. 193 classes were offered for the 2016 show. Halter classes were discussed. There were some questions whether to break out the halter classes into specific age groups, or to keep them as Junior/Senior. Discussion followed regarding the number of entries in the halter classes. It was decided to keep the classes as they were (Junior/Senior), but being open to changing to the age specific classes in the future if entries in these classes increase. Adding cattle classes was also discussed. 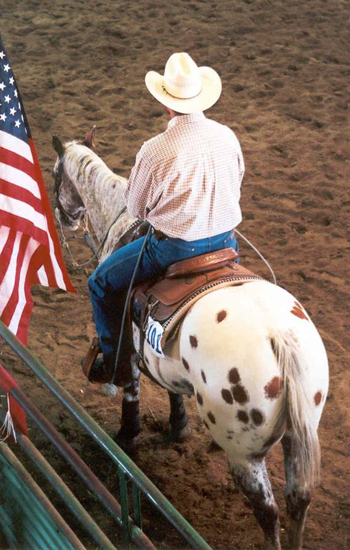 Classes included would be team roping, steer daubing, and possibly cowhorse. There would be no calf roping due to the time of the year. The group voted “yes” to offering cattle classes at the 2017 show. Jim Jirkovsky will be repsonsible for organizing and for providing the cattle. Cattle classes will be held on Saturday evening. The show will once again have 3 judges, offering 4 sets of points. Lori Graves brought up the idea of offering a circuit award contingent on attending a show in each state. Participants would have to attend the show in Kansas, Nebraska, and possibly Oklahoma, Iowa, or Colorado to be eligible for the circuit award. Discussion was held, but no decisions made regarding this. Each group is to take the idea back to the individual clubs for discussion. Dennis Johannes noted that the show that has previously been held in Des Moines the weekend after Labor Day has been moved in 2017. The show will be held in Cedar Rapids, September 23-24th. Other shows in Iowa will be in Iowa Falls, May 13-14th. The joint meeting was closed and the individual clubs went on to hold their own meetings. Discussion was held regarding the Fonner Park show dates, whether the show should be held Memorial Day weekend, or the first weekend in June. The club needs to check with Fonner Park regarding available dates. The club would like to continue with the Open Show on Memorial Day (May 29th), then with the Appaloosa show on June 2-3-4. The Special Even show would possibly be held Thursday, June 1st. There was discussion about other possibilities for clinic or other events during the week. A Ranch Horse clinic was mentioned as a possibility, as was a barrel race competition. Jim Jirkovsy will get more information regarding holding a barrel race. The current board will meet via conference call early January 2017. The date will be set later. No election of board members was held due to lack of attendance by NAC members. Cross-pointed shows will also be discussed on the call. The group discussed the need to schedule the spring membership meeting as early as possible. A tentatvive date was selected for Saturday, January 28th. Kim Trumble will check with Mona Schafer at the Alda Community Center regarding availability. The plan for the meeting will be a club meeting at 4pm, with a meal at 530pm. Brett Kleier volunteered to prepare the meat. The rest of the meal will be potluck. Drinks will be BYOB. The group decided to stay with the Nebraska Make-A-Wish Foundation as our charity for the June show. The group decided to go ahead with a Special Event in July, possibly in Kearney again. Lori Graves discussed the possibility of adding a horse show at the same time as the Madison/Sioux Empire Fair shows. It would be a third show to add to the timing of the other two. Lori has a friend in Homer, NE (just south of South Sioux City, NE), with facilities. There will be further discussion.